First cut a 6" x 9" piece of pink card stock and fold it in half for the base, a 4 1/4" x 5 3/4" piece of turquoise for the middle layer, a 4" x 5 1/2" piece of white for the front layer, a 2" x 5 1/4" piece of pink for the strip background, a 1 3/4" x 5" piece of patterned paper for the strip, a 2 1/4" x 3" piece of pink for the image background, a 2" x 2 3/4" piece of white for the image, a 1" x 2" piece of pink for the sentiment background and a 3/4" x 1 3/4" piece of white for the sentiment. Then create the background by inking the raised side of a Darice Paw Print embossing folder with a brayer and Stampin' Up! Melon Mambo ink. Then dry emboss the front layer. Next stamp the dog's head on scrap paper with Melon Mambo ink and cut it out then stamp the body on the 2" x 2 3/4" piece of white card stock. 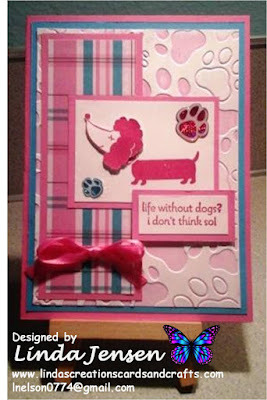 Next attach the head to the body with a mini pop dot then stamp the sentiment. Then create the strip using desired patterned paper (I'm not sure who made mine as I've had it forever and no longer have the package) and attach the ribbon. Next assemble the card, add any desired additional stickers or bling and enjoy!